Talking Gup-E in kelp camouflage mode! Gup features wheels so it can race and roll to the rescue! Press the antenna to hear Shellington and Barnacles talk about the details of their mission! Includes a Shellington figure and a leafy sea dragon to rescue! 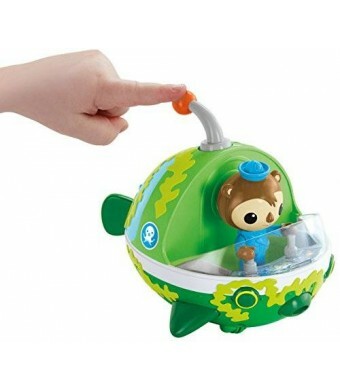 Perfect addition to any Octonauts collection! When the Gup-E is in kelp-camouflage mode, Shellington can observe, investigate and identify new creatures without being detected! Press down on the Gup's antenna to activate action sounds and to hear Shellington and Barnacles communicate the details of their rescue missions! Includes Shellington and a leafy sea dragon to rescue! Not intended for water play. Ages 3+.